The Great Barrier Reef Marine Park is a protected area within the Great Barrier Reef which is the largest coral reef in the world, and the biggest structure to be made by living organisms - coral polyps. I photographed J swimming around a large coral bommy on our last trip to the reef in July this year. What an amazing world lies beneath the water!!! Can you see the shadowy outline of a big fish slightly above J and almost off the left hand edge of the photo? This was a big Napoleon Wrasse, and he accompanied us on the whole dive. He would get very anxious if we lagged behind and would swim between us to encourage us to keep up. 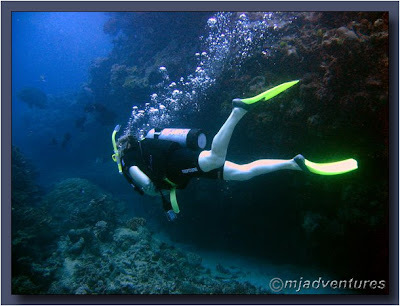 He led us around the whole dive site, even showing us an underwater archway to swim through. At one point I stopped to photograph a feeding turtle and he came right up to me and nudged my arm as if to tell me to hurry up! We can never fully anticipate what we're going to experience when we go diving!